Hey friends! I’ll keep this short and sweet because, well, I have kids… and I realize I’m super last minute with this post…probably because I have kids. 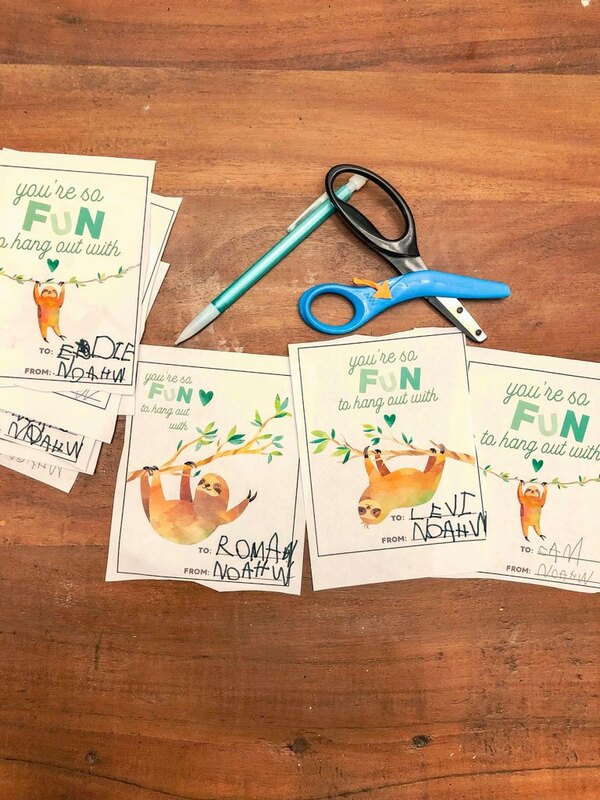 This year we went with a fun sloth theme and my little guy loved how they were hanging out upside down. It’s probably my favorite valentine I’ve made so far. I hope you enjoy!! Gift giving is my love language. It’s something I spend (maybe a little too much) time thinking about. Since I love supporting small businesses and I truly feel those are the most personal and well received gifts, I’m always trying to purchase from local and online small shops for gifts. It was so hard to narrow it down, but here is a round up of JUST A FEW of my favorite shops to find one of a kind gifts that are sure to be a huge hit. One of the most well received gifts I’ve ever given has been a custom handwriting sign by my friend Ali at Ali Wood Creations. We got my mother in law a small wood sign with my father in law’s handwriting hand cut. To say giving this gift was emotional would be an understatement! If you are looking to find something meaningful and personal, go check out Ali’s work. White Cotton Crafts creates beautiful jewelry and accessories by using recycled oyster shells. I have been eyeing up their oyster shell nativity scenes for years. This year they have ornaments that are so adorable! My best friend, Emily, owner at Texture Design Co., has some of my favorite gifts around. I love gifting her Calendars for Christmas every year. Each month features a hand illustrated Charleston flower box and the best part, you can turn it into framable art! She also has some super cute gift packages she is putting together this year. You’ll definitely want to check them out! Staying on the jewelry train, some of my two favorite shops are Minimalist Magnolia and January Jewelry. I love how the jewelry is minimalistic and dainty, yet can still make a statement. You are able to find personalized gifts for that special lady in your life. Some idea’s for the mama’s would be a dainty necklace with their child’s first initial, or a set of small stacking rings with their little one’s birth stones. The personalized gifts have been big this year. It’s really a great win for anyone! In our shop, the last name signs as well as the custom trays are always well received. 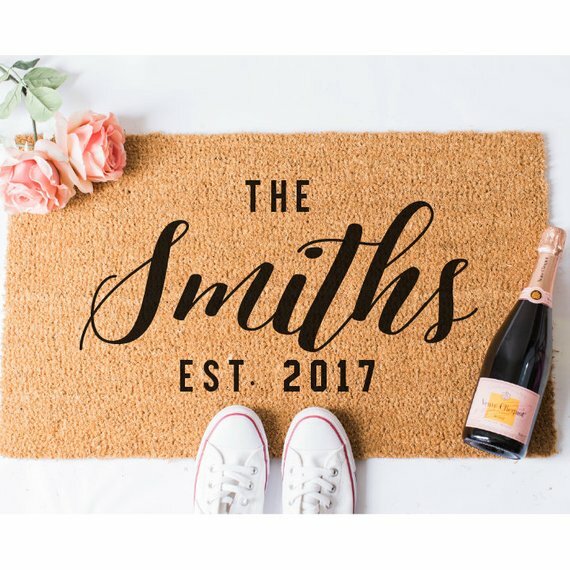 Personalized doormats are always a fun touch. I have ordered a few things from Fox & Clover Boutique and they’re great! I’ve been loving The Painted Press jewelry dishes. They are gorgeously hand molded and hand painted AND you are able to personalize them. These are so practical and a perfect gift for any friend, sister, or mama. We can’t forget about the kiddos! In the car today my four year old said, “I love Christmas because it’s all about celebrating Jesus and His birthday. But I really love presents, too.” ;) I’m not sure I’ve ever met a four year old who doesn’t enjoy opening a present. We try to be really intentional about gift giving with our kids. We want them to truly appreciate what they are getting. I might put a little too much thought into it, but I will say, my oldest still plays with the things he got for every Christmas in his four years of life. 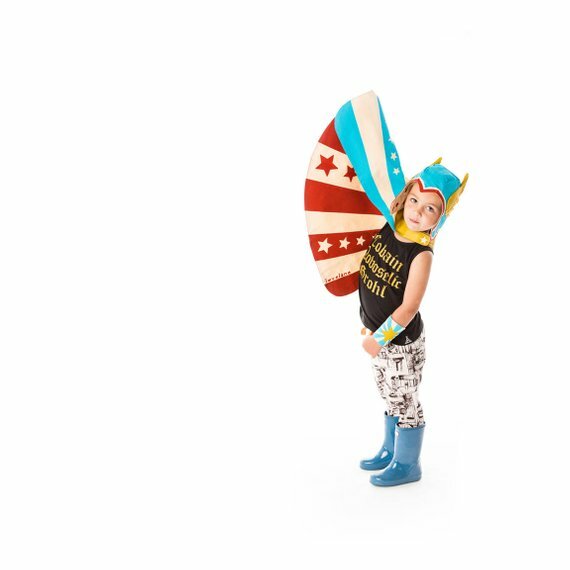 It’s a little tougher to find budget friendly small shops for the kids, but some of my favorite kid gifts are the ones where they can be creative and use their imagination. Superhero capes are a great option, and there are tons on Etsy! (not just for boys!) A few of my favorite shops are Love Lane & Little Hero Capes. If you are looking for great quality wood toys, check out Little Sappling Toys! Another great way to support small business while checking off your little one’s list is to shop at local toy stores. I know, I know, Amazon is SO much easier! But if you could just get maybe one or two things from that local toy store in your town, you’ll be supporting a real life family. One purchase will make a big difference, I promise. By supporting small businesses, you are putting food in little bellies. You are helping keep a roof over a family. You are helping a little girl take dance classes or a little boy play soccer. You are helping a student pay for their education. You are supporting a dream. I can promise that each of the shops listed put all of their heart into what they create, and you would make a huge difference in their life by giving their item as a gift this year. Here it is, y'all! The long awaited chocolate recipe! Ever since I shared that I make this chocolate weekly and stash it in my freezer, so many of you have contacted me asking for the recipe. The truth is, I didn't really have an exact science for the recipe. I have been making it for so long (about four years!) so at this point I sort of just throw all of the ingredients together and it makes perfect dark chocolate. I did a little experimenting and I *think* I've found the perfect recipe to share with you. Before we get started, I wanted to give a little background info. I feel like in today's world when you see "healthy" and "chocolate" in the same sentence people are immediately thinking, "well, that probably won't taste good..." or "yeah...right. that can't be true." but please promise that you will give this one a chance! My husband and I started our healthy eating journey nearly six years ago when we found out we were food sensitive (and in his case, highly allergic and reactive) to many foods. We both mourned the loss of many of our comfort foods but we quickly got back up and decided to find things that worked. That's when we met raw cacao. Who knew chocolate could be so HEALTHY!? Raw cacao is full of flavonoids, which act as natural antioxidants. Antioxidants protect the body from aging and disease caused by free radicals. It contains up to four times the antioxidants of traditional powder, and has the highest antioxidant value of all the natural foods in the world. Say whhaaattt?? If that isn't enough for you to be convinced, peep these five benefits of raw cacao. It has 40 Times the Antioxidants of Blueberries. Healthy chocolate full of health benefits... LET'S GO! The five ingredients in this chocolate are raw cacao powder, coconut oil, raw local honey, vanilla, and himalayan sea salt. 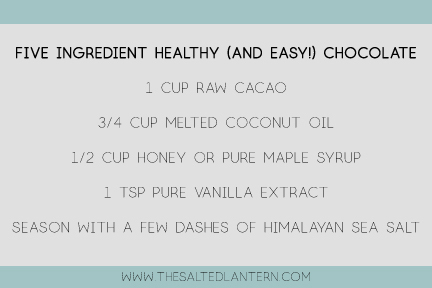 So not only is the cacao good for you... ALL of the other ingredients have health benefits as well. Basically it's the chocolate dream team. Coconut oil can get a bad rep because it's high fat content. But I'm all about that good fat. Have you ever heard of the KETO diet? We've been brainwashed to think fat is bad, but if you get the right kind of fat, it's so so good. Coconut oil is known to control blood sugar, help prevent high cholesterol and high blood pressure, strengthen your immune system, and help with digestion...just to name a few. Raw honey is my favorite natural sweetener. Honey can help with everything from low energy to sleep problems to seasonal allergies. Substituting raw honey instead of sugar and high fructose corn syrup is bound to help with weight loss if that's something you are concerned with. You can read more about the benefits of raw honey here. I always thought vanilla extract was just a good way to add some extra flavor to things, but it turns out it has some health benefits as well. It's proven to lower cholesterol, act as an antibacterial, and reduce inflammation in the body. Personally, I love my chocolate salted. A few years ago we switched to himalayan sea salt and I promise, you can taste the difference. Not to mention it helps balance the electrolytes in your body, increases hydration (seems backwards, right? ), balance the pH of your body to help reduce reflux, help the function of your metabolism, among many other things. If you want to read more about switching from table salt to himalayan sea salt, check this out. We also have himalayan salt lamps in each of our rooms and at first I thought it was just a pretty ambiance, but I swear I have noticed a difference in all of our sleep habits, including my children's!! Basically a mother's dream come true. Wondering where you can find all of these ingredients? We order from Thrive Market about 1-2 times per month. We have been on a strict budget (hi, one income family!) for the past several years, so my husband did his research on how to save us money on our grocery bill. And I really mean research. He curated a spreadsheet where he listed all of the staples we purchase regularly. He took the prices from Whole Foods, Publix, Trader Joes, and Harris Teeter and listed them for each product. He then went onto Thrive Market and compared each price. He found us some killer savings! Unfortunately health food is expensive, and we aren't willing to compromise our health. If it doesn't fit into our budget, we don't buy it, but Thrive Market has saved us in this area and we are so thankful! We purchase most things from there, but when we don't, we shop around on Amazon. If you're interested in the best things to purchase from Thrive, let me know and I'd be happy to share in a new post! We got the raw cacao from Thrive, but you can also find it on Amazon(linked above). The coconut oil is from Costco, because that's the most cost efficient for our budget, but you can find it in the link above on Amazon. The vanilla is from Trader Joe's, and the himalayan sea salt is also from Costco. We fill our little salt shaker from the big salt container that has lasted us nearly a year (or maybe more!). We always look for raw local honey for a few reasons. First, to support local bee farmers, and second to help with our seasonal allergies. Not to mention it has the best health benefits when it's raw and unfiltered. But you can definitely use pure maple syrup instead if you'd prefer. Trader Joe's has a good maple syrup for a good price! This one is from Publix, but it looks similar at TJ's. Step 1: Melt coconut oil in a pan on low heat or in a double broiler. It doesn't have to be fully melted, and you want to make sure it doesn't get too hot. Step 2: Add all ingredients to a food processor, we use this one. I will use the smallest container for this recipe. It was a wedding gift (six years ago!) and it still works great! Blend until smooth, about 30 seconds or so. Step 3: Put a piece of parchment paper in a cake pan or glass tupperware. Friendly tip, don't skip the parchment paper. Step 4: Pour the chocolate into the prepared dish and spread it out to be as thin or as thick as you'd like it. Step 5: Put into the freezer to harden. This usually takes about 10-20 minutes. That's it! I take small bites throughout the day to get my chocolate fix...I mean, to get my full magnesium intake. ;) You can also add walnuts, raisins, goji berries, or whatever other healthy fix-in you'd prefer. You can get away with much less honey, but I adapted this recipe with the thought that most people are used to really sweet treats. I typically put only 1/4c, if that, but if you like your chocolate sweet, you'll want to stick with the full 1/2 cup. Feel free to experiment with your own rations of the ingredients! The possibilities are really endless with this recipe. I made my son peanut butter cups for Easter, and we've also drizzled it on coconut milk ice cream as an extra special treat. You can also put it in a tupperware and store in the fridge for an "icing" like treat or a chocolate dip. Or to just eat spoonfuls. :) See what I mean, endless possibilities! You can find the links to all of the ingredients above. I've added them here to make it helpful for you to find anything you need, but obviously feel free to shop around if you find the ingredients elsewhere. Now go TREAT YO SELF to some healthy chocolate!! Be sure to come back and let me know what you think about it! For many (including myself) Valentine's day is seen as a hallmark holiday. I have never really been one to make a big deal over Valentine's day, but now with kiddos, things are a bit different. This is our first year of preschool for our (almost) four year old, which means ALL the holiday parties. He will be exchanging Valentine's with friend's at school next week and I got to thinking about the most budget friendly way to go about celebrating, but still be fun. I searched the stores for cute Valentine's and while they aren't super expensive, there were just a few things I wasn't thrilled with. First of all, I you have to buy a huge pack. My son only has 12 kids in his class so I don't want to be wasteful and throw out 20 valentines, ya know? Also, these things are likely going to end up in the trash anyway. I'm pretty sure these four year olds aren't going to be saving them for their scrapbooks. So essentially I would just be throwing money in the trash. No thanks? Second, I wasn't a huge fan of the messages on some of them. I wanted something cute and original that would be a good way to celebrate friendship, not necessarily modern day sentiments. One thing I do really love about Valentine's day is that it is a great opportunity to remind those around you that they are loved and treasured. It's a great chance for little ones to celebrate friendship and the joy that having friends brings to our life. It's a chance to spread and share the love of God! I'm definitely a fan of this. In efforts to save money & customize to make the cards more about friendship, I decided to make our own. And guess what? I want to share them with you...for free! 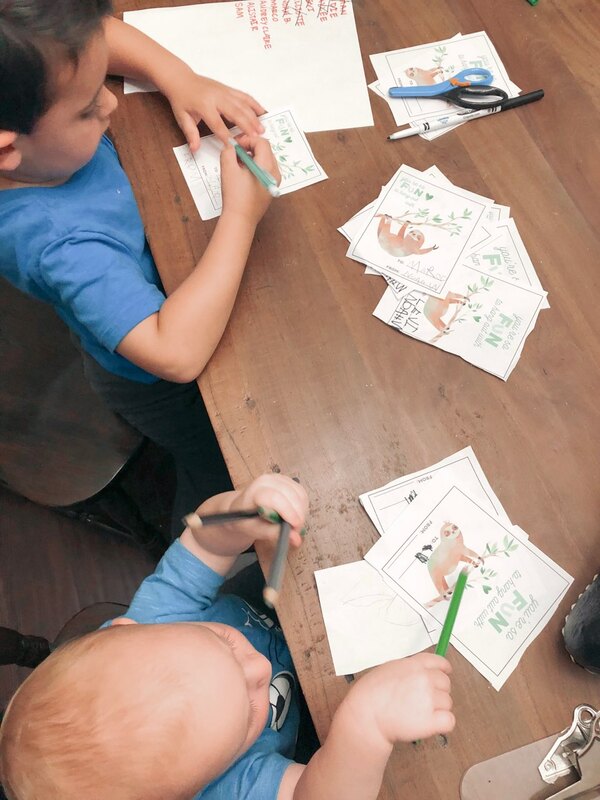 So, if you're like me and on a budget, but wanting cute little cards for your kiddos class, you've come to the right place. They're basic. They're cute. They're sweet. They are ALL about friendship. And best of all, they're original. Simply fill out the form below & I will send you a free PDF for some Valentine's Day printable cards! All you'll need is a piece of card stock and a printer! I PROMISE not to save your email address. I will just send the goodies and be done. :) I am a real person who also hates junk email. Thank you! We'll send the PDF over to your email shortly. In the meantime, check us out over on Instagram @TheSaltedLantern. When we were planning our wedding six years ago, I tried to be extremely conscious of our decor. First, it had to make sense with our budget. Was it worth it to drop over fifty bucks on table numbers that I would probably never use again? My quick answer was no. Did it make sense to buy things that said “welcome to our wedding”, “gift table”, “sign our guestbook”, and every other super cute wedding sign you could think of? Maybe for some people, but not for us. It was extremely costly and plus...what was I going to do with all of this stuff after the wedding was over?! But did I really have to sacrifice my Pinterest wedding board?!! I decided to make E V E R Y T H I N G for our wedding. Table numbers, signage, chandeliers, card box... you name it, I made it. I loved it because this is my kinda thing, but I also realize many people don’t have the time, or simply don’t like DIY projects! I’m here to tell you that you don’t have to sacrifice your budget, your time (diy-ing), or your space AND you can still have that “Pinterest event” of your dreams. You are STILL able to use beautiful handmade signage for your event! We are now offering wood sign decor FOR RENT! Extremely budget friendly, eco friendly, and PRETTY! We will have table signage, welcome signage, directionals, AND MORE! We’ll be starting with weddings, but adding decor for bridal showers, bachelorette parties, and baby showers. People will tell you that small business is hard & entrepreneurship is tough, but I have come to realize that you don’t really know how hard it can be until you are IN it. Some of y’all may have met us as Salt & Light Designs when we first opened up shop in 2012. If so, you’d know that we changed to Heartwood Creative Co. in 2015 for unforeseen issues (with our shop name). The name was so popular and since we weren't planning for our shop to be long term, we didn't research this prior to opening up. Therefore, we were unable to get any domain names or social media handles matching to our shop name. This wasn't great for marketing. We were both sad to see Salt & Light go, but we know ultimately it’s just a name and doesn’t change our product or who we are. Now here we are, yet again, facing another road block. We have prayed over this issue for the past 6 months. We have tried to solve it on our own accord. We have sought wise counsel. Ultimately, we came to a resting place where we said, “God, this is YOUR business, and we need YOUR help on our next step.” And we have been guided down this new path for our shop. Changing the name of a business isn’t a cake walk, y’all. But ultimately, it’s not about that. We want what God wants, because His plans are always way better than our plans. What has come out of this long period of prayer and uncertainty is an answer we’ve been longing for. Such a clear vision, & so much joy and excitement for what our future holds! You can write this name in stone, because it won’t be changing again, we promise. Heartwood Creative Co. is now The Salted Lantern. Salt is a flavor enhancer and it’s also a preservative. It is distinctive in taste, texture, and aroma. We live about 10 minutes from the sea & you can just smell the salt in the air the closer you get. You can even feel the stickiness of the salt on your skin after just a short walk on the beach. 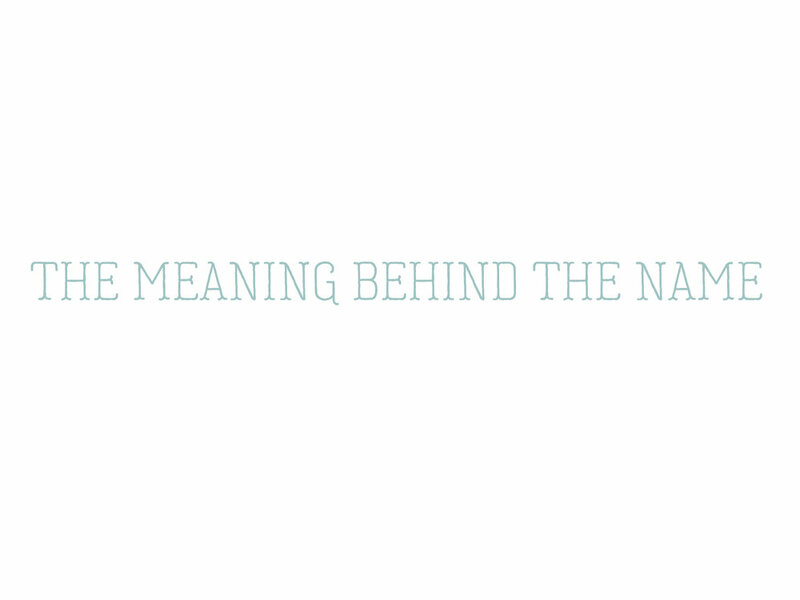 It is distinctive, powerful, and there is no hiding it’s there. The presence of light in darkness is unmistakable. It illuminates, brightens, and shines. It helps you see in dark places. What do you do when you walk into a dark room looking for something? You turn on a lamp, of course! We are called to be the salt and the light of the world. To enhance the “flavor” of the world. To “preserve” the world with goodness. To bring balance & hope to a broken world. Illuminating darkness by shining The One True Light. Your circumstances are an opportunity to shine brightly for The Lord and to share God’s overcoming truth with those around you. So that all who see you, will ultimately see Him. And that is our goal. Just like salt can become diluted in water, we can become “diluted” or altered by challenging experiences we face. Only by remaining focused on Christ and being obedient to Him can we expect to remain Salt and Light in our world. So, here we are, back to our roots of being Salt and Light, but with our own original twist. 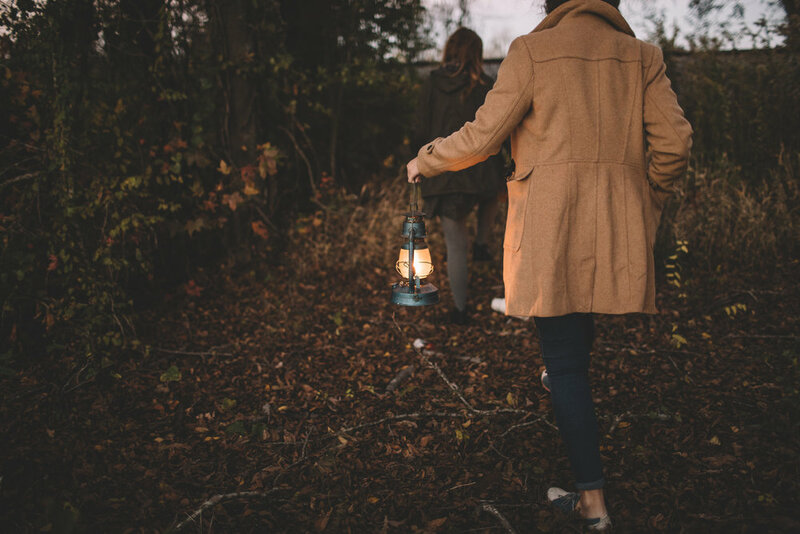 The Salted Lantern is a way to shine His light among the world. This shop is an avenue to connect with people we may have never had the chance to talk to. And we hope that our interactions with you would encourage and uplift you and we hope our work would spread Light. We can’t wait to see how God will continue to grow us through this.